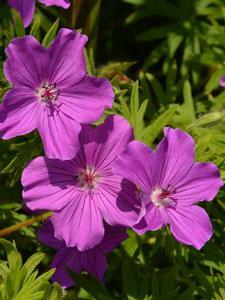 This Cranesbill type of geranium forms a fast growing mound of dark green foliage. Small magenta pink flowers are produced in abundance throughout summer and autumn. Suitable for ground cover or large pots. Ideal planted under standard roses or a topiary. Wonderful in a mixed perennial border. An easy care perennial for any situation. Clip back any long growths to within 10cm of the crown to get fresh flowers. Plant in a sunny or semi shaded position and enjoy.